Prime Minister Ranil Wickremesinghe on Thursday said that national security, as always, is paramount and defence capabilities and personnel are important in protecting the stability and the democracy of the nation from threats and challenges in the 21st century. 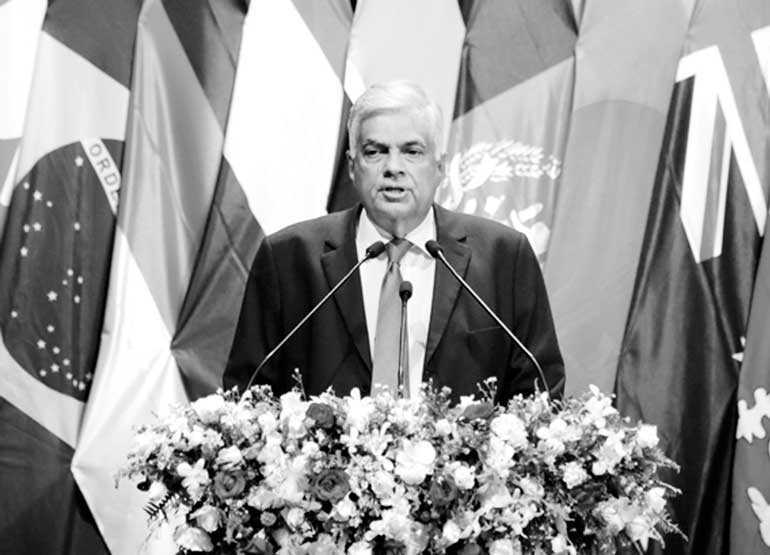 Delivering the keynote address to the ‘Colombo Defence Seminar – 2018’ inaugural sessions on Thursday (30) morning at BMICH, Prime Minister Wickremesinghe said the 21st century opens up an age facing an array of traditional and non-traditional security threats. “The 21st century opens up an age facing an array of traditional and non-traditional security threats emanating from natural calamities, climate change, human exodus and displacement, violent non state actors, issues of ethnicity, new-fangled ideology, religious radicalism and political activism, with most leading to the threat of violent extremism,” he said. The Premier noted that the technology driven new media including social media is another source of non-traditional threat. “New media including social media sites such as Facebook, Twitter and other websites on the internet are also becoming global disruptive forces. We have seen the potential of this new media to destabilise nations and affect serious change in the case of countries like Tunisia, Libya, and Egypt, etc.,” he pointed out. Addressing several aspects of security threat perceptions, the Premier underlined the need to foster working relations and good rapport to meet with future security challenges at both local, regional and international levels. Role of national militaries will eventually expand from safeguarding national security to building effective international security communities in order to furnish the rising demand of security for global supply chains and overseas interests, where it is foreseeable a close integration of political, economic and military communities for optimum results, the Prime Minister added. Sri Lanka Army’s annual defence seminar this year scheduled to be held on Thursday and Friday, 30-31 focused on a wide spectrum of global and regional concerns including climate change on the theme, ‘Security in an Era of Global Disruptions’. The host of participants and foreign delegates attending the Seminar include Minister of Defence in Rwanda, General James Kabarebe, High Commissioners, Diplomats, Foreign Envoys, Governors, retired Army Chiefs, Secretaries, Senior Officers, retired Senior Officers and a galaxy of scholars and defence partners. It is certainly a privilege and pleasure to deliver the keynote speech at this distinguished security forum which I believe will set the tone for an unprecedented intellectual interaction. Colombo Defence Seminar 2018, lays claim to a legacy which goes back eight years, beginning with the defeat of terrorism in year 2009. The success of the seminar inspired its continuation to what it is today – a fully-fledged international forum dedicated to matters of security. Ladies and Gentlemen, I must congratulate the Sri Lanka Army for putting Sri Lanka on the world map by staging this event under a very relevant and timely theme, not just for Sri Lanka, but for all the countries represented in this forum – ‘Security in an Era of Global Disruptions’. I also take this opportunity to thank the Commander of the Sri Lanka Army for inviting me to deliver the keynote address at the Colombo Defence Seminar 2018. The 21st century opens up an age facing an array of traditional and non-traditional security threats emanating from natural calamities, climate change, human exodus and displacement, violent non state actors, issues of ethnicity, new-fangled ideology, religious radicalism and political activism, with most leading to the threat of violent extremism. Though the nature of war fare remains as in ancient times – a clash of interests between and among organised groups or state on state. However, the science of warfare has drastically changed. Chairman Mao Tse Tung once stated that the “political power grows out of barrel of a gun”, but 60 years later conflicts are no longer limited to conventional weapons and battles, and therefore conflict management and resolution demands a more comprehensive and integrated approach than ever before. Today’s battle field is not only expanding, as noted by United States Army General Mark Odom, it is converging and compressing, creating a situation where the fast moving global trends across all elements of national powers are transforming the nature of present society and impacting on the human life, including the character and nature of warfare. In a broader perspective, these trends are attributed to rapid advancement in science and technology where the innovations and inventions are made possible at a lightening pace and increased human interaction facilitated through internet and social media making cognition, perceptions and opinions instantly available to influence the masses across the world. Some of the other significant trends that are reshaping the future global arena include the emergence of new economies and economic rebalancing, competition for resources, cyber and space warfare, collective and artificial intelligence, demographic changes and urbanisation, big data, power generation, robotic, mass manufacturing, technology and engineering as identified by the US Army’s training and doctrinal command. Development of these trends are even potential enough to outgun the most advance and sophisticated militaries in time to come and to deliver a new global order in the future. 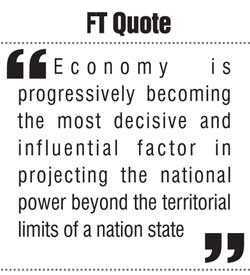 Economy is progressively becoming the most decisive and influential factor in projecting the national power beyond the territorial limits of a nation state. In the context, elements inherent in economic growth such as access to raw material and other resources, power generation and storage, mass production, flow of capital and investments and preservation of existing and capturing of new market opportunities would become extremely lucrative and thereby competitive amongst existing and emerging global powers. Such a competitiveness would inevitably deliver some positive and negative effects to developing nations worldwide, therefore, the economic progress of developing world will largely depending upon the national strategies they adopt to closely integrate into productive economic endeavours whilst smartly avoiding the counter-productive engagements. Role of national militaries will eventually expand from safeguarding national security to building effective international security communities in order to furnish the rising demand of security for global supply chains and overseas interests, where it is foreseeable a close integration of political, economic and military communities’ optimum results. 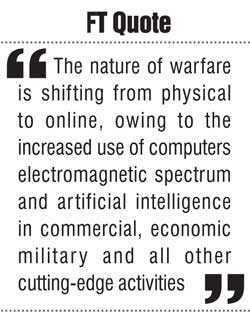 On a different but a more realistic perspective the nature of warfare is shifting from physical to online, owing to the increased use of computers electromagnetic spectrum and artificial intelligence in commercial, economic military and all other cutting-edge activities. Critical services at risk from a cyber-assault include, but not limited to political, economic, financial, energy, transportation, security infrastructures where vulnerability management of cyber based systems has become an extremely demanding task in the face of innovative use of technology by the attackers. It is essential to apply the best practice approach to reduce national vulnerabilities immediately and to develop a robust cyber security system to prevent the disruptions by attackers with collaboration of all nation states. Technology driven new media including social media is another source of non-traditional threat. New media including social media sites such as Facebook, Twitter and other websites on the Internet are also becoming global disruptive forces. We have seen the potential of this new media to destabilise nations and affect serious change in the case of countries like Tunisia, Libya, and Egypt, etc. Moving from the virtual battle space to the real world, we encounter new trends and shapes of violent extremism. This in the spectrum of conflict, can begin from a peaceful demonstration and swing all the way through insurgency to catastrophic terrorism. Present day conflict is in this realm and fits into the space of Irregular war (IW) the violent struggle between the state and non- state actors having access to the most modern technology. These conflicts are historically protracted and test the resolve of a nation and other parties involved. There is no quick-fix or recipe that meets all irregular threats, because the nature of the new will be alien from that of the past. The state and the military must learn its lessons from the past, but the response should be on contemporary lines of action. Effect of the environmental degradation and climate change on the human life is another significant factor that needs the global attention. They grossly undermine the national security of nation Estates in multiple ways, sometimes causing severe internal and international frictions, beside their physical devastative effects. Environmental changes not only impact the human life, it can also undermine the economic prosperity of a nation which is the key to country’s military capacity and national power. It is noteworthy that most of the developing countries, and to some extent in developed countries, natural resources and environmental services constitute of significant pillars in economic growth and national employment rate. In that perspective, a nation’s economic security, ‘employment security, social security’ and even political stability could be adversely affected due to the effects of environmental erosion and climatic changes. Moreover, undesirable changes in environmental conditions can expose communities to health hazards, undermining the human capital and its well-being which are considered critical elements in socioeconomic of a nation. Climate change is an inevitable phenomenon that is being experienced globally in various forms such as temperature rise, sea level rise, droughts, floods, hurricanes, landslides, etc. Global warming is expected to lead to increase in temperature, frequent droughts, erratic rainfalls and rise in sea level which will adversely affect Sri Lanka where 24.3% of the population are in agriculture and 7.5% of the GDP comes from agriculture. In addition, Sri Lanka will also be energy poor since the country derives up to 40% of its electricity generation on hydropower. Low economic growth will definitely affect the livelihood of marginal groups making economic inclusiveness difficult. Recently Sri Lanka experienced a drought lasting five rice cultivation seasons as well as torrential floods in the tea growing areas – this may be a sign of things to come. Energy is an essential element of the modern human life. Uninterrupted energy supply at an affordable rate is a crucial factor in economic development of any nation. We should take -a step forward to mitigate the disadvantages incurred to us due to uneven distribution of natural energy resources by adoption to renewable energy sources and converting to energy efficient systems. Long term strategies to reduce our dependency on the imported energy resources should be incorporated in to the National Security Plan to enhance the energy security in the future. Entering in to international agreements to underpin international energy trading relationships should be another timely consideration. In the past when diplomacy failed conventional war was the only available means of achieving the desired political end in the field of international politics. But today, multi-dimensional global disruptive forces can considerably weaken the state. This is a new version of Sun Tzu’s Attack by Stratagem. The “skilful leader subdues the enemy without fighting; he captures their cities without laying waste to them; he overthrows their kingdoms without lengthy operations in the field.” Hence, global disruptive forces can be used as an instrument by one state or a non-state actor to weaken another state before gaining control of that entity. Therefore the responses to combating these threats will need a solid strategy. This includes identifying the gaps as well as the soft and hard powers needed to achieve the desired end-state. Multinational cooperation in all forms of affairs, particularly in the issues related to national and international security, therefore is essential due to the complex nature of threats developing against the humanity and mankind. In such a complex world, the effectiveness of militaries are more realistic to visualise in a collaborative and cooperative landscape than a competitive arena. In the context, military professionalism should grow with the transformation of operational environment, retaining the ability to engage in a broader spectrum of security whilst keeping a step ahead of the adversaries at all times. In conclusion, seminars such as this, when men in the profession of arms, and those in the business of statecraft, congregate to focus their intellect in bringing about practical solutions to security issues of this age proves that security, as always, is paramount to all nation states and cannot come second to any other need. Hence these new issues must be recognised as national security threats. A number of civilian institutions will be required to work with the defence establishment. New mechanisms both civil and military need to be created. Finding the threat perception is such that global security needs a global response. 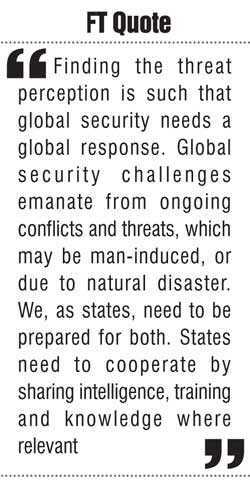 Global security challenges emanate from ongoing conflicts and threats, which may be man-induced, or due to natural disaster. We, as states, need to be prepared for both. States need to cooperate by sharing intelligence, training and knowledge where relevant. Good rapport and a working relationship among security stakeholders, locally and internationally, are the keys to success in meeting future security challenges. It is my belief that the deliberations at this seminar would bring about positive solutions, and an understanding of the present day security issues, and that original thought will prevail. I am certain that together, we will foster greater cooperation and friendship, helping us to serve as one for a secure and peaceful future.